So there I was on the perennial search for obscurity. In the world of old Television shows there is one that remains elusive. 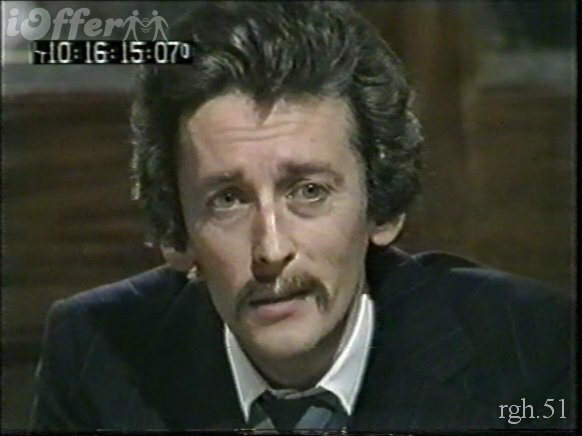 It is “Looking For Clancy” a five part series for the BBC starring Robert Powell. Apparently it is available here but I am somewhat nervous of the whole thing as this site has been around for a while and the material would surely have leaked elsewhere by now and of course it hasn’t. Mullally turns out be quite a character! Of Irish descent he rose from a working class London upbringing to be a newspaper editor in India at 19. He was a journalist up until the 1950s when he formed his Public Relations business. In 1949 he abandoned a prospective candidature of the Labour Party for the constituency of Finchley and Friern Barnet. He began writing novels in 1958 with his first hit, Danse Macabre and wrote many more along with some freelance journalism in his retirement. Check out Mullally’s wedding reception picture from his days in public relations when he had names like Sinatra and Hepburn on his books. There are three major players in postwar British Socialism present. Bevan’s wife Jenny Lee was the Scottish leftwing pioneer who introduced the Open University to British education. Herbert Morrison, then Deputy PM and standing to the left of Mullally was grandfather to Peter Mandelson that dark practitioner of the Blair and Brown years of New Labour. Reading into Mullally’s biography one can see elements that would be portrayed in the Clancy book and TV series. “CLANCY, Frederic Mullally’s major novel to date is about a man and his city and the events that shaped this man’s life from childhood to middle-age. The city is London, which is to say that the city is as complex and evolving a ‘character’ in the story as the central character himself; for this is London, chronicled with love, from the ‘shingle’ of the twenties to the thigh- boots of the sixties, from the crystal set to ‘The Box’, from the General Strike to the Student Revolt. The story of CLANCY is the saga of an Irish policeman’s son who makes an odyssey upwards through the English g class—structure and onwards through his own achievements, only to discover, with John Donne, that a man must ‘Be thine own palace, or the world’s thy jail’. He has drunk at every spring, plundered every orchard along the way. He has sinned and been sinned against, brushed shoulders with greatness and wallowed in the fens of an irrepressible sensuality. Finally, when the peaks he had aspired to are at eye-level all around him, a girl younger than his own daughter leads him to the chasm’s brink. What Clancy sees when he looks down is not the death—pit beckoning a social maverick but the broken corpse of the alter ego he has betrayed on the way up. His anti-fascism would reveal itself in “The Battle of Ridley Road” article he published where he was challenged to attend these rallies himself. He was attacked and rescued by the Jewish 43 Group. This would lead him to write the book “Fascism Inside England”. “Novelist Frederic Mullally, now 85, met Orwell a few years later at the Tribune, the left-wing Labour Party weekly that Mullally co-edited. Orwell served as literary editor and wrote a short weekly column, “As I Please,” on politics, popular culture and anything else that struck his fancy, all for the princely sum of 10 pounds a week — less than a junior reporter made on a mediocre British daily in those days. “George was a very complex person,” Mullally recalls. “He was ramrod-straight, never a smile. He wasn’t scowling, just solemn. He had a high-pitched voice, and an upper-class British accent with just a little cockney overtones that he introduced into it. Mullally says he waited for the grin that would signal Orwell was joking. It never came. Mullally wrote and helped produce a spoken word history recording on LP called The Sounds Of Time featuring selections of spoken word taken from over two hundred hours of BBC Radio Recordings including Churchill, King George VI, Attlee, Montgomery, Nehru, Bevin, Hitler, HG Wells & many more. He also was involved with writing a softporn satirical stip called “Oh Wicked Wanda” for Penthouse magazine in the 1970s. While being exploitative fare and NSFW, some of the images are interesting in their use of a variety of oil, watercolour, poster paint and tempura by Ron Embleton, a veteran comic book artist, who had worked extensively for TV Century 21 comic, illustrating stories based on the television programmes Stingray, Thunderbirds, and Captain Scarlet and the Mysterons, amongst others. Much of this article has been taken from the Frederic Mullally website created by his son Micheal Mullaly to whom All Rights are reserved.